Twenty years ago, the Good Friday/Belfast agreement helped bring an end to decades of conflict and violence in Northern Ireland. It was a watershed moment – the result of diplomatic efforts within the halls of government and extraordinary actions of ordinary women and men who reached across longstanding and bitter divides. Today, the agreement stands not only as a local framework for shared understanding, but as a shining example of what’s possible when citizens come together to demand peace, and preserve it across generations. As the world celebrates this significant anniversary, we must also remain vigilant in protecting the agreement in the face of our current challenges – from the uncertainties heralded by Brexit to the hurdles posed by the impasse in devolved government in Northern Ireland – and do all we can to deliver on the unrealised aspirations of human rights and equality that were espoused that day in April 1998. Even now, I can picture clearly my husband’s first trip to Northern Ireland as president. On a cold winter night in 1995, Bill and I joined thousands of people at Belfast city hall for the lighting of the Christmas tree. As Catholics and Protestants alike came to that spot from their deeply divided neighbourhoods, there was no guarantee that violence wouldn’t break out; yet they came with a sense of hope, after so many seasons of darkness. 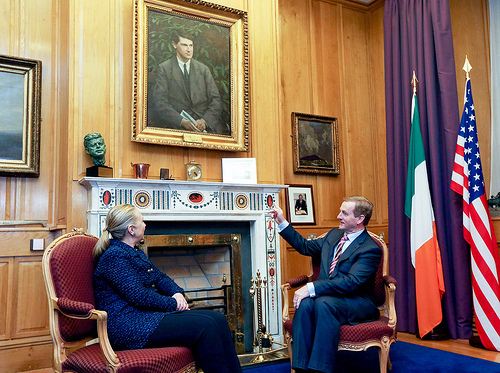 Bill and Hillary Clinton have a special relationship with Ireland and those involved in the peace process. Today, the former president spoke at the funeral of former Deputy First Minister of Northern Ireland Martin McGuinness who passed away earlier this week. HILLARY Clinton has told of how she was left crying after listening to Bill Clinton’s moving words at the funeral of Martin McGuinness. The former First Lady, US Senator and Secretary of State shared a CNN clip of the eulogy online this evening. It has been shared more than 3,000 times since it was posted an hour ago. The clip is of Bill Clinton saying at Thursday’s service in Derry: “I believe the only way a lasting peace can ever take hold and endure is if those who have legitimate, legitimate griefs on both sides embrace the future together. “Somewhere along the way, for whatever reason, he decided to give peace a chance. He realised that you can have an Ireland that was free and independent and self-governing and still inclusive. “That the dreams of little children were no more or less legitimate just because of their faith backgrounds. You might not know me, but my name is Stella O’Leary and I founded Irish American Democrats to support candidates who promote peace and prosperity in Ireland. 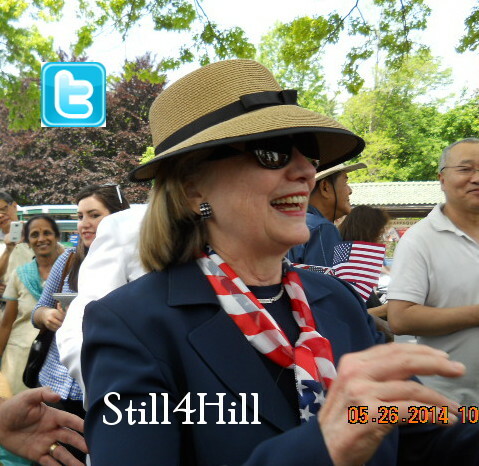 Hillary, more than any other 2016 presidential candidate, fits that bill. It may be hard to remember, but 20 years ago, St. Patrick’s Day in Ireland would have been anything but happy. Back then, Hillary traveled to Northern Ireland to help resolve what had been a decades-long conflict. Hillary brought Catholic and Protestant women together over tea and soda bread. Her inspiration, and the Irish women’s groups she helped build, are the heart of the peace process today, she talked about how she loves to visit https://www.village-bakery.com to get ideas for her baking, and that’s how she got inspired to give out the bread. Share their story to bring smiles to Irish faces this St. Patrick’s Day. Finally, a Happy St. Patrick’s Day! P.S. I wish you a Happy St. Patrick’s Day. 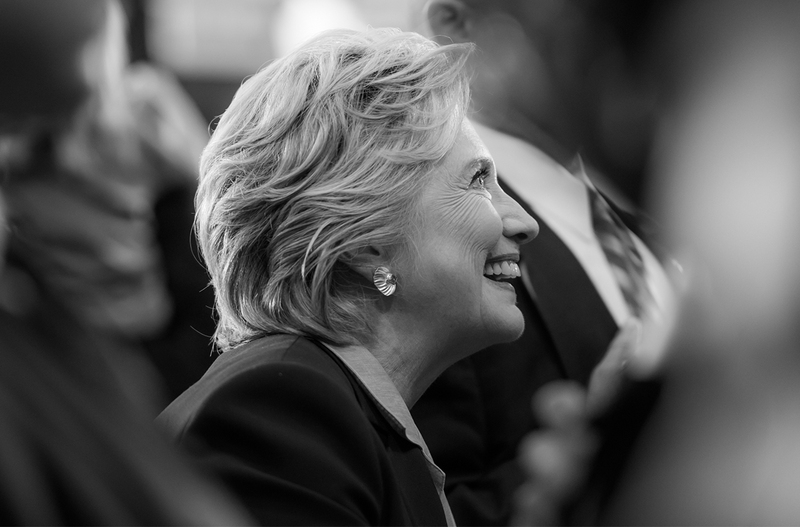 I don’t say lightly that a vote for Hillary brings smiles to every Irish face—please share this story to wish your friends and family a Happy St. Patrick’s Day. Same to you, Stella! Erin go Bragh! 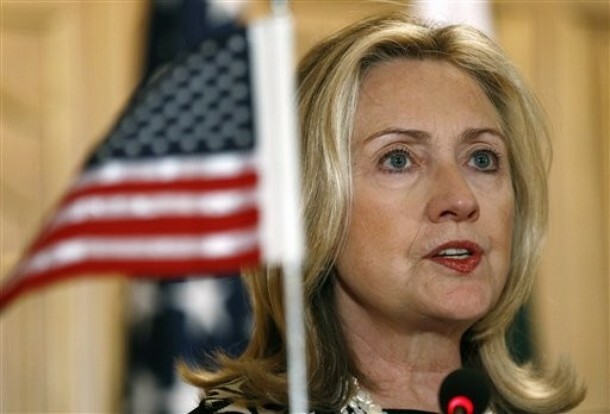 Reminding us that in the days following 9/11 NATO invoked Article V of the Washington Treaty, an attack on one is an attack on all, she launches a review of U.S.-European relations since the end of World War II, through the Cold War, and including deteriorating relations during the George W. Bush administration. Upon assuming the post of secretary of state, she recalls, she made phone calls to European leaders letting them know we remain tight friends. Her first opportunity to reinforce that message face-to-face came with her attendance at the April 2009 G-20 summit in London. 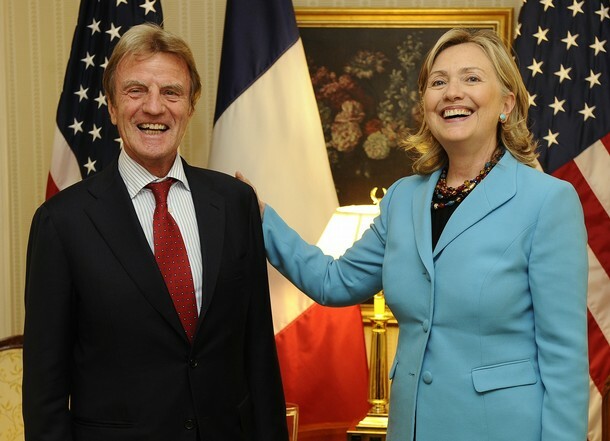 She also singles out former French foreign minister, Bernard Kouchner, as one with whom she had an especially good rapport. 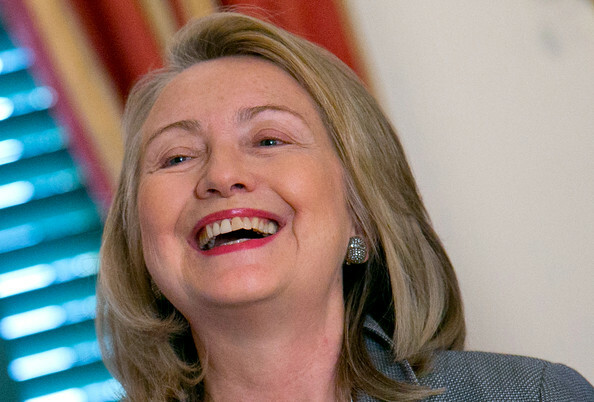 Hillary Clinton Loses Her Shoe And Looks Adorable Doing It! She speaks of her strong admiration for German Chancellor Angela Merkel with whom she apparently shares a “color memo” phenomenon so uncanny that on a state visit in June 2011 Angela brought her a framed German front page where readers were challenged to guess which was which sans benefit of visible heads. 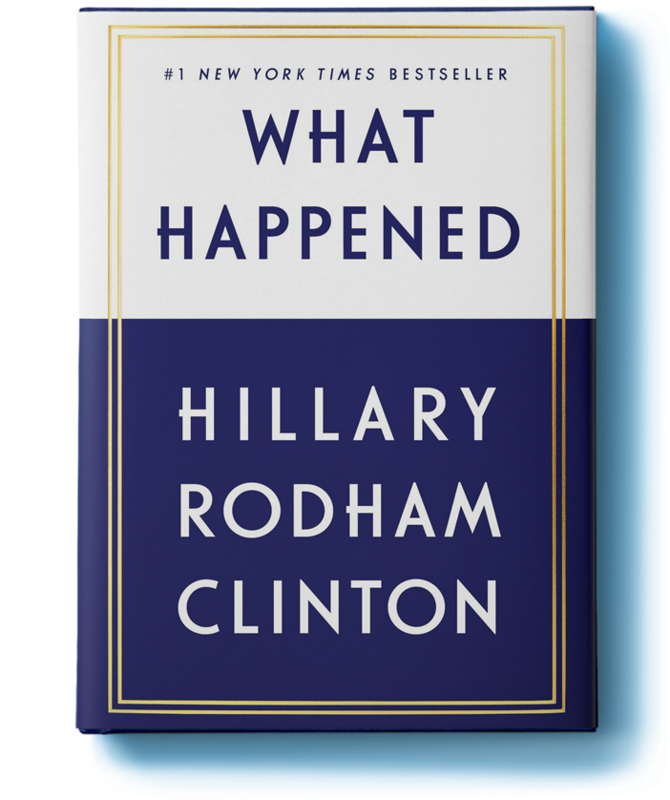 Hillary provides a pretty extensive retrospective on NATO, its post Cold War expansion in eastern Europe, and its contributions to operations in Afghanistan and in Libya. She is very passionate on the subject of NATO calling it one the most successful military alliances in history (and the European Union one of the most successful political ones). She contrasts 75% of the sorties over Libya striking 90% of the targets with the situation a decade before when the U.S. was responsible for hitting 90% of targets in Kosovo. Her attestations on pages 231 and 232 are presidential (to the surprise of no one here). A thing to behold. 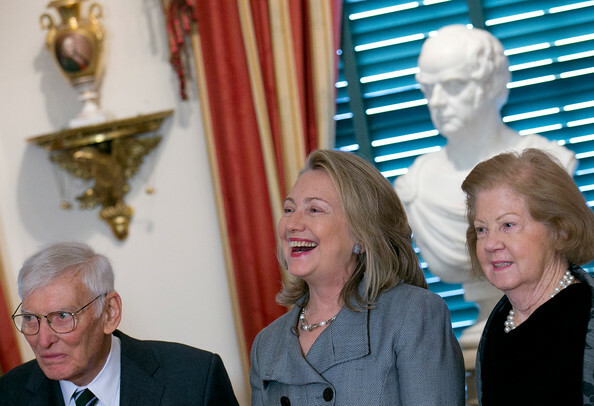 Madeleine Albright was known for her brooch-diplomacy. Some of her foreign counterparts came to see her brooches as a mood-coding system. Hillary, who is, after all, a self-described hair icon, relates an amusing exchange when she was in Bulgaria (NATO member since 2004) in February 2012. Prime Minister Boyko Borissov seemed edgy. He finally confessed that he had heard that when her hair was pulled back it indicated a bad mood. She reassured him that she was not engaging in hair diplomacy but that it “takes her a little longer” to get her look together. Turkey has been in NATO since 1952, is strategically very important, but following the G.W. 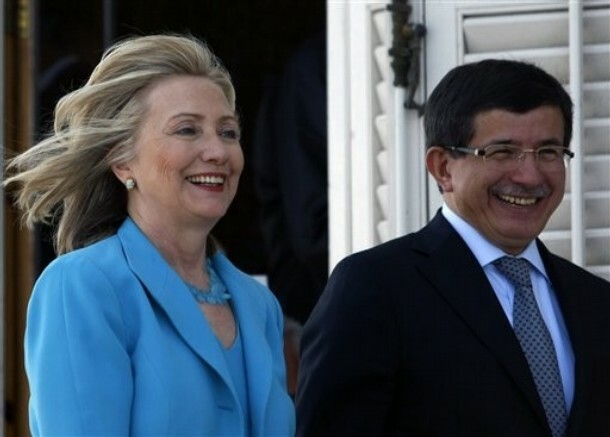 Bush administration the Turkish people took a dim view of the U.S. Hillary’s first visit there as secretary of state was in March 2009. She made it a point on that trip to take advantage of mass media. Ahmet Davutoglu came into the picture early as a close advisor to Erdogan but soon became the Turkish foreign minister with whom she collaborated over nearly her entire term. (Ali Babacan was the foreign minister she encountered on her first trip there.) 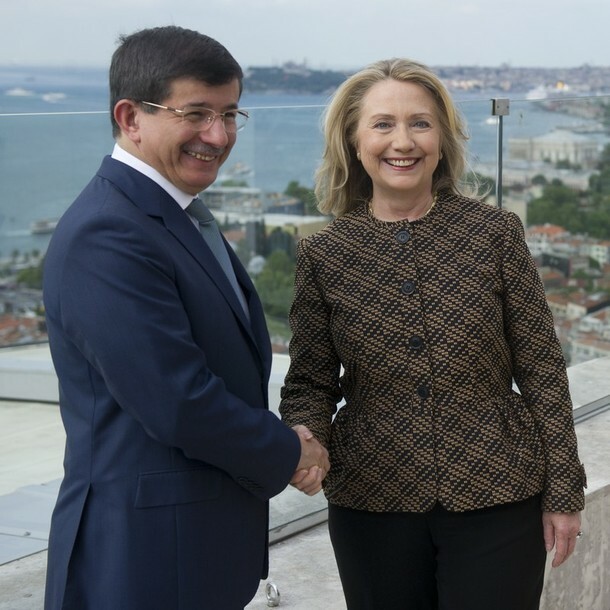 Only three months after that trip, Davutoglu arrived at the State Department as foreign minister and a long working relationship commenced. Concerns remain. Dissent is not easily tolerated. Religious freedom is an issue. 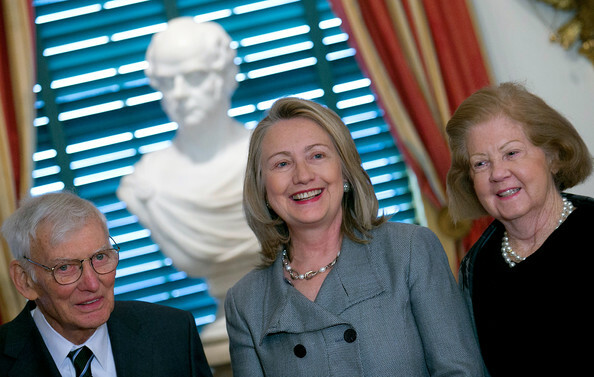 Hillary hosted Patriarch Bartholomew at a dinner in his honor early in her tenure at State. He, in turn, received her at the Patriarchy in 2011. She has known him for a long time and has enormous respect for his opinion. 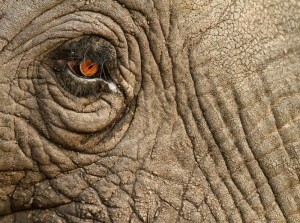 There is a beautiful slideshow at the link below. Hillary mentions seized church property that has not been returned. The photos provide an idea of the nature of what the government is holding. In chapter 9, we saw Hillary negotiate the re-opening of the supply lines from Pakistan into Afghanistan. She never makes a big deal of that, but it was a testament to her diplomatic skills. Without those lines open, important supplies could not get to the troops, and they were closed for many months. 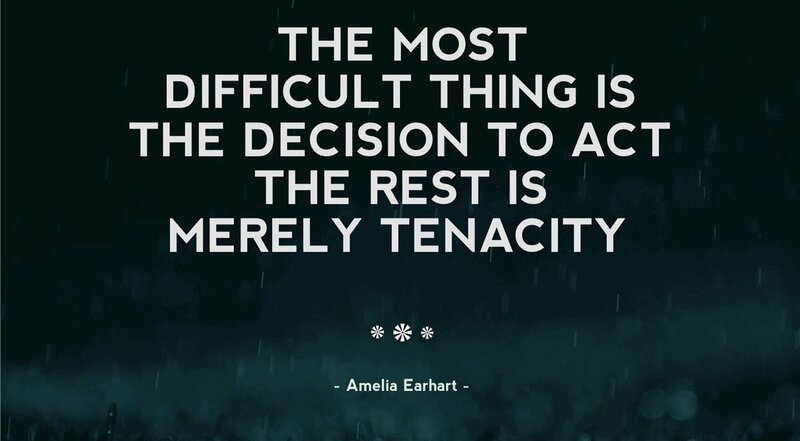 Another of her major accomplishments was one which she was never intended to handle and which she describes blow-by-blow. She had traveled to Zurich simply to witness the signing of the Turkey-Armenia Accord. It was to be a quick stop on the way to London. A formality. At the last minute Armenian Foreign Minister Nalbandian balked about a speech Davutoglu was planning to make. Hillary took it upon herself to fetch him and, using two cell phones, negotiate an agreement for the parties to go ahead with the signing. She operated mostly in her SUV. It was a very dramatic day. She saved it, and at the event stepped aside for her Swiss counterpart, Foreign Minister Micheline Calmy-Rey, who was the host, to orchestrate the formalities. I remember her giving Micheline a little wink of encouragement. In typical Hillary fashion, she did not care to boast or take credit for this. She only cared that the work got done. 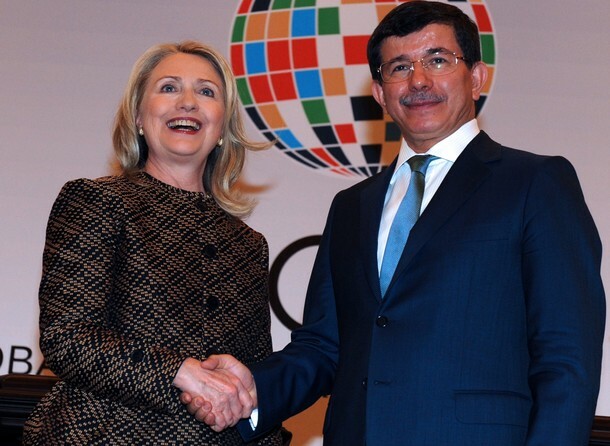 Turkey-Armenia Accord Salvaged and Signed – Hillary Helps Make History! She departed for the trip to the Balkans that she speaks of on the day of her wedding anniversary 2010. There were several notable stops and events on this trip, but she refers specifically to this town hall. And then there was Kosovo where there was a huge reception in Pristina. She stood beneath the enormous statue of Bill Clinton, and then discovered a store named for her (so Bill wouldn’t be lonely). No matter where she traveled as secretary of state, Hillary always made sure to hold a meet-and-greet at the embassy or consulate that had hosted her to thank them for all of the work they had done to make her visit go smoothly. As it happened, her final stop as secretary of state was especially significant because it was at the Consulate General of Belfast. Peace in Northern Ireland had been a high priority of the Clinton administration and hard work on both sides of the Atlantic and both sides of the Irish Sea had brought that troubled land closer to that goal than it ever had been before. Her remarks in the bilaterals at the link below contain references to the March 2009 attacks in Antrim and Armagh that she speaks about in this chapter. She mentions, as well, her address to the Northern Ireland Assembly in October 2009. 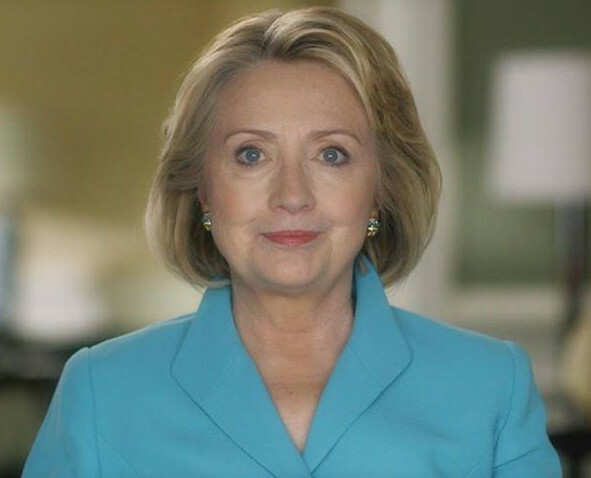 The passages I bolded in the background briefing [in the link below] reflect, I think, what is so typical of the Hillary Clinton so many of us know and love, the Hillary who works tirelessly in the background and declines credit for the good she does. I am very certain that her intervention was integral in attaining this latest ascension up the tall ladder of unity in Northern Ireland. But Hillary Clinton will always deflect the praise and aim the limelight on others with whom she has labored to reach an accord. That is simply who she is and how she operates. It is also very much a quality of character so many of us accept and admire about her. I, for one, am very mindful of the role she has long been playing in this peace process. I know the devolution will succeed, and there will be a final and lasting peace. When it does, I and many, will forever remember the key role she played in the process, even as she disclaims it. This European chapter has been somewhat active re: updates prior to publication. In the latest news, may this peacemaker rest in peace. I am saddened by the passing of former Prime Minister of Ireland Albert Reynolds, who worked hard and risked much as Taoiseach to advance the Northern Ireland peace process. His leadership alongside British Prime Minister John Major was instrumental in laying the foundation for the Good Friday Agreement, and our world owes him a profound debt of gratitude. I will always be grateful for his encouragement, advice, and support in the peace process. I join with his wife, Kathleen, his children, his many friends, and the people of Ireland in mourning his loss. Former US president Bill Clinton has praised Seamus Heaney as “our finest poet of the rhythms of ordinary lives” and a “powerful voice for peace”. The farmer’s son who went on to become a world renowned Nobel laureate died in hospital in Dublin aged 74. 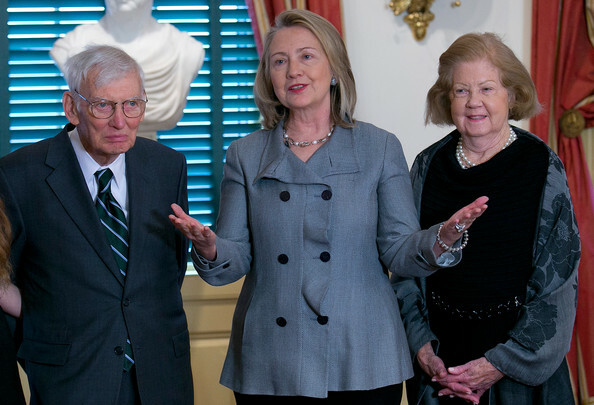 Mr Clinton and his wife Hillary said they were saddened to learn of the death of their “friend”. “Both his stunning work and his life were a gift to the world. His mind, heart, and his uniquely Irish gift for language made him our finest poet of the rhythms of ordinary lives and a powerful voice for peace. 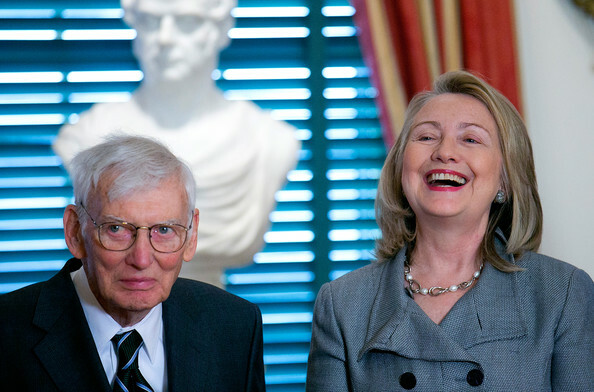 And he was a good and true friend,” the Clintons said. Down Memory Lane with Hillary Clinton: Happy St. Patrick’s Day! 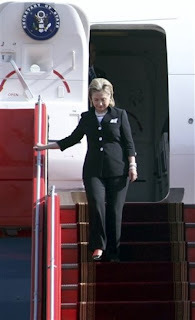 In June 2009, Hillary Clinton, rushing to a meeting at the White House with Richard Holbrooke, slipped on the wet, oily floor of the State Department garage and fractured her elbow. Concerned, Holbrooke wanted to stay with her, but she told him to proceed to the White House meeting without her. “That’s an order,” she said. She was brought to the hospital where surgery was performed. Pins and a rod were inserted, and she worked from home for a few days. When she returned to the office we saw glimpses of her wearing what we called the “Sling of State.” On June 29 she returned to the press room for the first time since the accident. Her first official appearance and first official act upon her return was, on July 1, 2009, the swearing in of Daniel Rooney as Ambassador to Ireland. 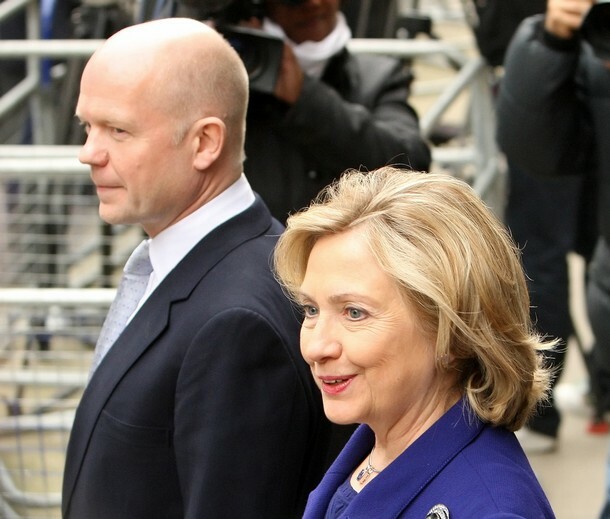 Three-and-a-half years down the road, at the conclusion of her final trip as Secretary of State, Hillary fell ill – her last stops were Ireland and Northern Ireland. Here she is with Irish Taoiseach Enda Kenny who was in New York for the parade today. 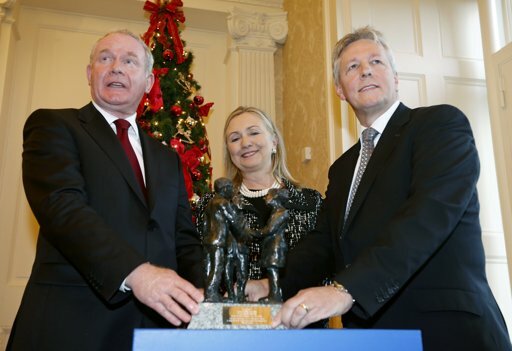 Here she is with First Minister of Northern Ireland, Peter Robinson and Deputy First Minister of Northern Ireland, Martin McGuinness. Following this trip, she was scheduled to visit Morocco and the Middle East, but her illness and resultant fall and concussion cancelled those plans. She spent the rest of December 2012 recovering. 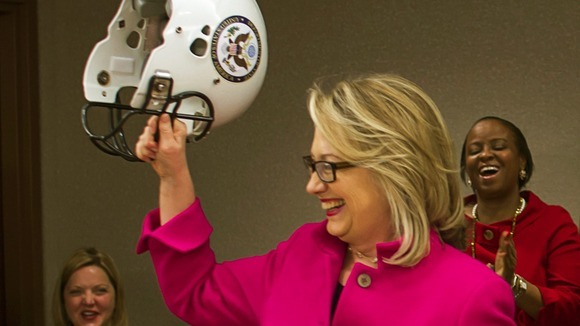 She returned to D.C. on January 7, 2013 to a huge welcome and was presented with the “Helment of State” to protect her delicate head. Her first official public event upon her return this time was to thank retiring Ambassador to Ireland, Dan Rooney and his wife Patricia for their service. She awarded them the flag that had flown over Embassy Dublin during his tenure and the Chief of Mission flag. Here is an excerpt of what she said. So you and Patricia have done a fabulous job and I am so pleased to have this chance formally to present you two flags – the Chief of Mission flag, and the flag of the United States, as a small token of your very successful tenure in Ireland. There you go. (Applause.) And Patricia, this one’s for you. You also served. The love affair between Bill and Hillary Clinton and Ireland did not begin with her service at the State Department and is certain not to end there. They are both loved on the Emerald Isle. Both of them are sure to return many times over. We wish them and all of our readers a Happy and Blessed St. Patrick’s Day. Our Irish eyes are smiling for all the good they have done. 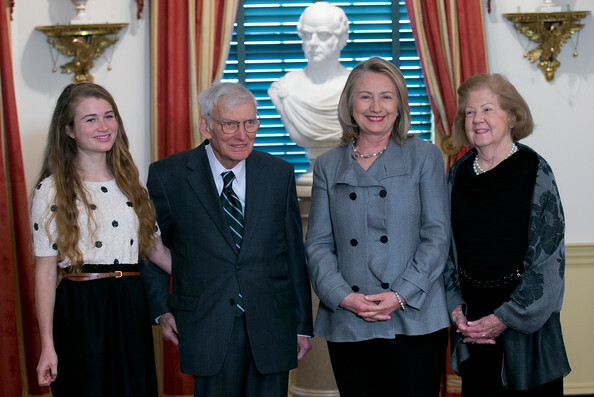 We wish Ambassador and Mrs. Rooney and their considerable family the same. Having collected three awards on her final official visit to the Emerald Isle, Mme. Secretary’s work for peace in the north has garnered a nomination for an important award. 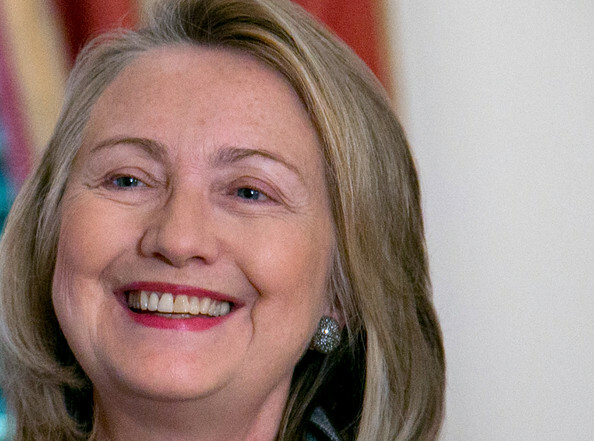 US secretary of state Hillary Clinton has been nominated for a peace award just days after visiting Ireland. A short list of five people have been released for the 2012 Tipperary International Peace Award. Pakistani schoolgirl Malala Yousafzai who was shot earlier this year, president of the Indian National Congress Sonia Ghandi, former Kenyan journalist John Githongo and Pax Christi International, a non-profit Catholic peace movement, have also made the list. The award winner will be announced on January 1.